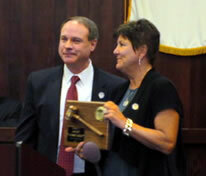 Randolph’s annual reorganization meeting was held January 1 at town hall. Among those in attendance were Congressman Rodney Frelinghuysen, Senator Anthony R. Bucco, Assemblyman Anthony M. Bucco, Sheriff Ed Rochford, freeholders Kathryn DeFillippo, John Cesaro, Tom Mastrangelo, Hank Lyon and freeholder-elect Christine Myers and Deborah Smith, Morris County Clerk Ann Grossi, Morris County Prosecutor Fred Knapp, municipal court judge Ira Cohen, Morris Township committee member Bruce Sisler and former Randolph mayor Michael Obremski. Councilman Roman Hirniak, who served as deputy mayor last year, was selected by his peers to serve as mayor for 2016. Councilwoman Christine Carey will serve as deputy mayor.